Greetings all! My first post is to display the find that brought me here. I found this kit in a thrift store down the street. They wanted $100 for it, but gave me a military discount! I was thrilled, since I have been to see the ship when I was on a business trip in Boston. It really made an impression on me. I enjoyed the museum. I learned about the time during a storm when the ship came loose from its lines and was swinging around on its remaining moorings. It swung into the modern steel warship moored next to it and did extreme damage to it, while taking only scratches itself. An amazing ship, undefeated in battle (even if it required her crew to man the boats and tow her out of the doldrums.) My background in making stuff is mixed. Plane models as a kid, home repair, car modifications, machining, and extensive gunsmithing. I have never done anything more detailed in wood than a pinewood derby car, but I'm ex-military, and believe I can follow a manual. Looks like everything is here. We'll see! This area of the forum was a great resource for information on where to buy various types of wood. Let's rebuild that information using our collective knowledge and experience. I've given credit in parenthesis to those who have contributed the name of that source. Sources of milled wood (Australia): Modellers Shipyard (Shazmira) - A limited selection of sheet and strip stock. They also have kits, tools, and other supplies. Ships internationally. Sources of milled wood (France): Arkowood (TRJ) - Portal of the German company (see below). Sources of milled wood (Germany): Arkowood (TRJ) - A bit on the expensive side, but good for smaller quantities. All major wood varieties, including swiss pear, box, lime. Massivholzwerkstätten Horschig (Redshirt) - Good assortment of wood, high accuracy and good price. Sources of milled wood (UK): Hobby's (AntonyUK) TwigFolly (Marsares) JoTiKa (Marsares) Cornwall Boat Models (Marsares) The Model Dockyard (Marsares) Sources of milled wood (USA): Crown Timberyard - A good selection of the more popular species of wood for model ship building. Tends to be milled very precisely, to a smoother finish. Ships internationally. Wood Project Source - A good selection of the more popular species of wood for model ship building. Tends to be milled very precisely, to a smoother finish. Ships internationally. Itasca - Mainly a source for basswood. Their "Half Price" wood is still of good quality and excellent value. $20 minimum order size. 20% military discount. National Balsa - Another source for basswood, Maple, Cheerry. More expensive than Itasca, but they have a greater range of sizes and have lots of dowels. 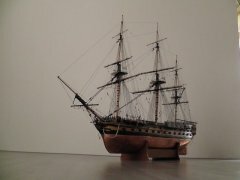 tallships_model_builder (themadchemist) - An eBay store with several items targeted towards model ship builders (eg. Deck planking and sheet wood). May be willing to cut custom sizes for you. http://www.northeasternscalelumber.com/shop/index.php?PHPSESSID=fbf4aea8bc5623641aa53ab405ec4c6a - Northeastern Scale Lumber Sources of rough lumber (Australia): Trend Timbers (1492) - Local, imported and exotic timbers. Anagote Timbers (Jim Lad) - Local and imported timbers. Named after a pet goat called Anna. Australian Furniture Timbers (BANYAN) - A wide selection of timbers. Avilable in 1 meter lengths. Sources of rough lumber (UK): Workshop Heaven (AntonyUK) - Various sized chunks of exotic wood Yandles (Kevin) Sources of rough/billets lumber (USA): Gilmer Wood Company - Mainly Exotic wood and much of it highly figured. The main species of interest for ship modelers will be boxwood, ebony, and holly. $100 USD minimum order for Internet purchases, no minimum for walk-in purchases. Ships internationally. Cookwoods (mtaylor) - Exotic hardwoods. Ships internationally. Righteous Woods (davec) - Domestic, imported and exotic timbers. $100 USD minimum order for Internet purchases. Ships internationally. Tallgrass Custom Wood Productsfff382 (Thairinker) - Domestic hardwoods. Located in Kansas, does not appear to offer shipping. Woodworkers Source (Sephirem) - Domestic and imported. Lumber is organized based on geographic region that it comes from. Sources of rough lumber (global): A local hardwood store - Usually a great place to buy domestic wood and some exotics. I have seen ebony and purpleheart at Woodcraft. A local hardwood flooring store (muzzleloader) - Mahogany, maple, cherry and other hard woods. Inquire about sales of remnants at bargain prices. A note on Gilmer: This is a local business for me so I am fortunate that I can visit. If you've purchased milled Castello Boxwood for your model then it probably came from here. They told me that they don't have a source for this wood anymore, but in addition to the large stack of wood towering over me they also had a bunch more in another warehouse. The Castello Boxwood starts out as rough 8/4 (2" thick) boards around 6" wide and 7' long. When the stock on their website gets low they pull down a board, clean it up in a planer, spray with shellac to bring out the color, then seal the ends with wax. They told me if I was to buy a board off the top of the stack it would be $30 a board foot (1"x12"x12") but that if I wanted to dig through the stack they'd up the price to $35 per board foot. Indeed, the chunks on their website were about $35 a board foot when I last ran the numbers. Ebony is tricky stuff as it all looks the same in pictures so ask them to select a board with straight grain, if you tell them it is for a ship model they will understand what you need. When I was there last they showed me how to hold the ebony to the light to check the grain for straightness. Also don't be too concerned if the description of Castello Boxwood on the website is "figured" as that is what they listed my piece of wood as and it was actually fairly straight. Not all wood can be sold to customers outside of the USA because of laws to protect endangered species. Many, many years ago I bought a Brazilian boxwood trunk. I had it rough sawn into planks ranging from 3/4” to 1/16” thicknesses (see attached photos). The planks are about 36” long. I now want to use this now well-seasoned wood for a model, but I need to finish the timber before I can use it. I’m seeking advice as to the best and most accurate way to achieve a smooth surface finish with a consistent thickness throughout the length of each plank. Should I use a planner/sander, or...? With thanks in advance! How to handle fresh wood? On Tuesday we had a big storm in Germany in y neighbourhood a walnuttree was knocked down - today I can get some wood for helping to saw. So I'm going to help. For the work I'll be able to pick some of the wood. Due to the price of wood the do want to get for sawed wood in the internet I'm willing to invest a bit of time and sweat. But my question is how to handle the wood. I know it must lager for a timeof about two years to get dry. So that I can't use the wood imediatly. So I have to peel off the bark? Or shall I try to cut the branch in to quater or eightedge bar. They will be around 5-20cm / 2-9' diameter abd 30-50cm / 12'' - 18'' long. With a bit of good luck I'll get a bit thicker parts. I have only got a little table saw by Proxxon and an old scroll saw to cut. Hope you don't say after all this work: “Sorry fot you but just walnut has the wrong grain for 1/64 shipbuilding.“ Thanks for your intrest und help. Using ammonia to bend wood. I found this website during browsing for another thing. It has a lot of good info but also ideas of what we builder can built ourselves to help us in the workshop and having some diy tools. Specially lathe setup with a power drill seems interesting. This build is in planning at this time, should start in the next month or two. I have the kit and have checked the parts and started to prep them for building.